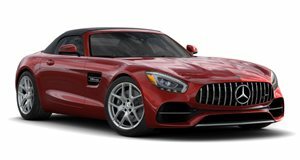 Mercedes has offered the AMG GT in a wide, almost -like array of configurations: coupe and convertible, in base, S, C, and R specs. If you wanted the top in convertible form, you were left out in the cold... but that changes today with the introduction of what could be the best version yet of the Silver Star sports car. 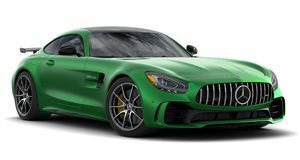 Bowing this week at the , the new Mercedes-AMG GT R Roadster packs Affalterbach's 4.0-liter twin-turbo V8 in front of its open cockpit, tuned to deliver 577 horsepower and 516 lb-ft of torque. The power is transmitted to the rear wheels through seven speeds and a dual-clutch transmission. Top up or down, it'll scurry to 60 in 3.5 seconds and keep pulling until it's blurring the scenery at 197 mph. Those are the salient details, but there's much more for performance geeks to delve into. Like the enhanced, dynamic aerodynamics package that reduces front-end lift by 88 percent at 155 mph. Or the tracks that have been widened by 1.8 inches at the front and 2.2 at the back compared to previous, "lesser” versions of the .